Bring a large pot of lightly salted water to a boil. 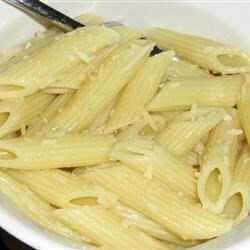 Add penne pasta and cook for 8 to 10 minutes or until al dente; drain. In small saucepan, saute garlic a small amount of oil. Combine garlic, olive oil, and pasta in a bowl. Mix in parmesan cheese. I found this recipe to be too bland for my tastes, but it tasted much better after adding fresh chopped tomatoes and a bit of fresh squeezed lemon. I didn't think this recipe had any flavor to it at all. This is a great quick meal. I added a little twist by adding some sliced sausage with sun-dried tomatoes.